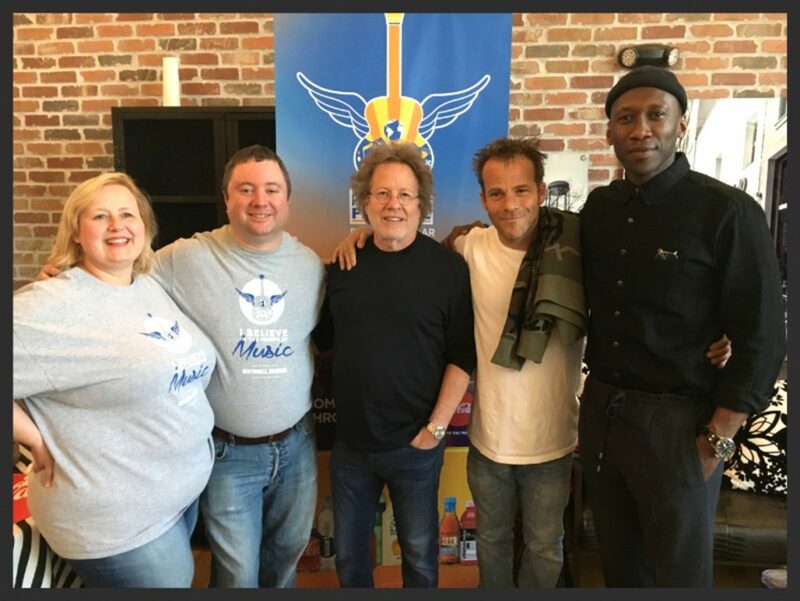 World-class songwriters traveled to Bentonville, Arkansas, during the Power of Music Festival on April 26-29, giving listeners a rare chance to hear the stories behind the songs. The proceeds benefit the I’ll Fly Away Foundation’s music education program, which brings songwriting into area schools in order to elevate test scores and classroom engagement. Pictured (L – R): Power of Music Festival’s Betsy Brumley-Bernier and Kevin Bernier; Steve Dorff; Stephen Dorff; Mahershala Ali. With dozens of shows and artists, the event drew top talent like 2018 Songwriters Hall of Fame inductee Steve Dorff (“Through the Years,” “Every Which Way But Loose”). His solo performance at the elegant Haxton Road Studios in Bentonville attracted cast members of HBO’s True Detective, including his son Stephen Dorff and Oscar-winning actor Mahershala Ali. Steve Dorff also participated in multiple book signings for his new memoir, I Wrote That One, Too…: A Life in Songwriting From Willie to Whitney. Three members of the Nashville Songwriters Hall of Fame united for a well-attended round at Meteor Guitar Gallery. The lineup featured Roger Cook (“I’d Like to Teach the World to Sing”), Richard Leigh(“Don’t It Make My Brown Eyes Blue”) and Dennis Morgan (“I Was Country When Country Wasn’t Cool”). Other highlights included original music from Steve Poltz (Jewel’s “You Were Meant for Me”),Jerry Salley (Chris Stapleton’s “Outlaw State of Mind), and Keith Sykes (Jimmy Buffett’s “Volcano”). Additional talent included indie-Americana band The Accidentals, female vocal group Farewell Angelina, Latin rock ‘n’ roll band Making Movies, inspiring rapper Saul Paul, guitarist-songwriter David Starr, and Emmy-winning composer Jonathan Wolff (Seinfeld, Will & Grace). A number of aspiring songwriters from the region also performed at venues like Two-25 Events and Bike Rack Brewery. The festival featured 42 shows and 51 artists over four days and included an education series for aspiring performers with guest speakers like soul music icon Al Bell (Stax Records). The festival is organized by the I’ll Fly Away Foundation, named for the iconic song “I’ll Fly Away,” written by Albert E. Brumley. His granddaughter, Betsy Brumley-Bernier, founded the I’ll Fly Away Foundation with her husband, Kevin Bernier. Find the most current Steve Dorff tour dates from our partners at Country Music On Tour, your trusted country concert ticket source! Country Music News Blog participates in advertising programs that help fund the operation of this site. For more information please visit our privacy statement. This entry was posted in Community, Steve Dorff by Shauna "WhiskeyChick" Castorena. Bookmark the permalink.